On September 13, 2017 in Allentown, Pennsylvania, Mack Trucks, Inc. revealed their new revolutionary designed Class 8 over-the-road truck, the Mack® Anthem™! Born of the American spirit, the Mack Anthem comes standard with a bold design, tough engineering and a high quality, comfortable interior. This new truck was built for productivity with the necessities of the driver in mind. The bold design of the new Mack Anthem grille features a bridge across the front bearing the big bold MACK name with two trim options available. The Anthem challenges the expectations of an aerodynamic design with a bold look that displaces the air to the sides as well as over the hood and roof, in order to cut wind resistance and improve fuel economy. From the hood slope and fairings to the mirrors and air dam, every component of the Mack Anthem has been engineered to maximize efficiency. There are many design elements that have been implemented for the purpose of keeping operating and repair costs down, in particular the three-piece hood and three-piece bumper. With the truck driver in mind, these components have been designed so as to be able to separate and repair each part individually in order to lower repair and/or replacement costs. In addition, the breakaway hood and side mirrors are spring-loaded to rotate when hit, which will prevent damage to the body and also lowers the parts and repair costs. Under the three-piece hood of the Mack Anthem you will find Mack’s MP® engine (MP7, MP8 or MP8-TC) with up to 505 horsepower and 1860lb.-ft. of torque. The MP engines offer superior fuel economy and are engineered for efficiency and performance to conquer the highway for miles and miles. When the occasion arises for the engine to be serviced, the new Anthem offers a tilt-assist hood and functional, modular design to allow service professionals easy access to repair and replace components more quickly. The single-point latch and tilt assist design requires 50% less effort to open the hood, and the check and top-off oil and fuel levels can be accessed from the ground. The interior of the Anthem has also been designed with the driver in mind. The Anthem’s intuitive, automotive-inspired instrument panel and steering wheel give drivers total confidence and control. Illuminated controls help keep their eyes on the road, and the flat bottom steering wheel is an industry-first that allows for more belly room and clearance for entry and exit. In addition the race car style grip and enhanced dash visibility provide better control and maximized comfort. The interior also includes a 5” full-color Mack® Co-Pilot™ digital display, a 7” touchscreen for information and entertainment display, new larger rocker switches, a light control module to run all the exterior lights, and power window, lock and mirror controls. Ergonomically designed seats provide drivers comfort while they work. The 70-inch stand-up sleeper version of the new Mack Anthem offers up to 35% more space to give drivers plenty of room to get comfortable and rest. Three bunk and storage options are available to accommodate any driver’s needs, with features including built-in window shades, power outlets, and USB ports, dimmable lighting, versatile pullout work surfaces, various storage compartments, and even the ability to add a refrigerator, microwave and 24” flat screen TV. 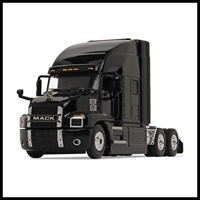 This extraordinary, bold, new Mack Anthem truck is one that must be considered by any company looking to update its fleet. First Gear is extremely excited to add a replica of this outstanding truck into their 1/64 scale diecast metal collectibles product line! This all new model features the authentic design of the 70-inch sleeper version with its distinctive front grille bridge featuring the ‘Mack’ wordmark, opening hood with authentic MP® engine detail, accurately detailed cab interior, pivoting fifth-wheel, detailed undercarriage, chrome-plated accessories and you can’t forget about the iconic Bulldog hood ornament! This new cab replica measures approximately 5” long, 1.9” wide and 2.5” high. There are several model combinations and colors available with this initial release, and these trucks will make a great addition to your collection. 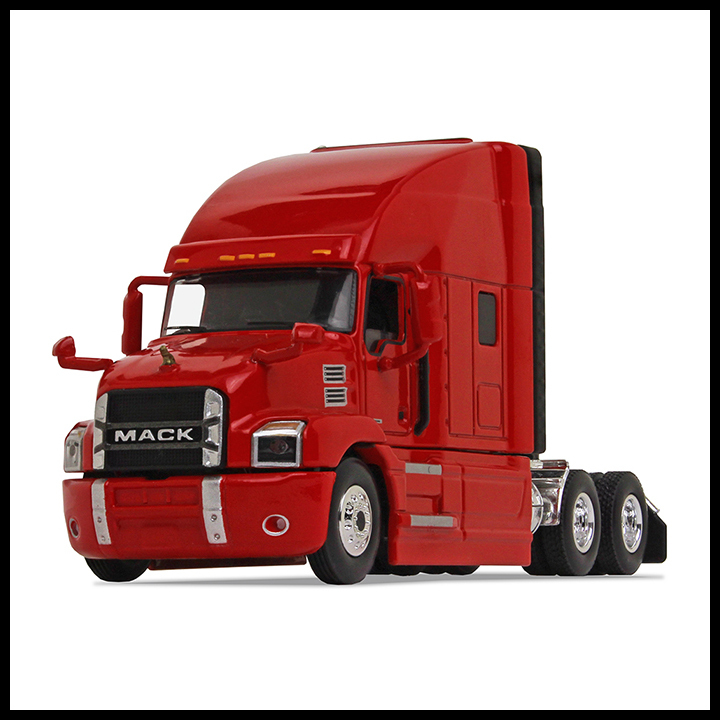 For more information and to order this die-cast replica Mack Anthem from First Gear, please visit: www.FirstGearOnline.com.